After a quick layover in Dublin, myself and three other IR students arrived in Brussels after eight hours of plane travel. There are multiple options to get from Brussels Airport to the Leuven Institute by public transit, but we chose to take a taxi due to our embarrassing amount of luggage (see below). Most of our friends, however, had taken the train which was a quick twenty minute journey. Some of our classmates had already arrived, and others would be arriving in the following days. In addition to the twelve students from SJU (pictured below), there are students from three other participating universities; DePaul University, the Catholic University of America, and Northeastern University. In previous years there have been ten to twelve students in total but this year there are thirty-two. We are the biggest group of American students to ever live and study at the Leuven Institute! Driving into center Leuven was surreal. I had seen pictures from friends who had studied abroad in Leuven the previous semester, but nothing could have prepared me for the real thing. All four of us sat in silence staring at the surrounding city. We drove past Town Hall, through the Oude Markt, and finally arrived at the Institute. While many other students who study abroad stay with host families or in dorms, the students who study abroad in Leuven stay at The Leuven Institute for Ireland in Europe. The Leuven Institute, formerly known as the Irish College, was originally a Franciscan College that gave Irish-Catholic academics a foothold in Europe during the reformation. Presently, it is a hotel that hosts academic groups such as ours. There is one wing of the Institute that the American students stay in. The rooms are either two levels (two bedrooms with the bathroom on the first floor) or three levels (two bedrooms with the bathroom on the middle floor). Every week, the staff change our towels, bedding, and do basic maintenance. The staff primarily comprise of helpful Irish college students who are doing a hospitality internship. Breakfast, lunch, and dinner are served from Monday to Thursday. On the weekend, only breakfast is served because most students elect to travel outside of Leuven. There are five academic classes available at the Institute; European Comparative Politics, European Law, History and Development of European Integration, European Economics, and Cultural History/Art History. Because the experiential internship at the European Parliament counts as a class, students from SJU only have to take four of the classes. Classes typically take place on Monday and Thursday, and the internship is on Tuesday and Wednesday but may vary based on your placement. All of the lecturers are faculty members from KU Leuven, the University in Leuven. Every Tuesday and Wednesday, students intern at the European Parliament which is an easy train ride from Leuven. There are seven institutions within the European Union, and the internship takes place at the European Parliament (EP) in Brussels. There are 751 members of parliament who represent 28 member states and 7 political parties! I am interning for Dr. Alfred Sant, the former Prime Minister of Malta, who is now the head of his political party’s delegation. Dr. Sant is part of the Progressive Alliance for Socialists and Democrats (S&D) which means that he positions himself to the left of the political spectrum. S&D is the second largest political group in the EP, after the European People’s Party (EPP) and before the Alliance for Liberal Democrats in Europe (ALDE). 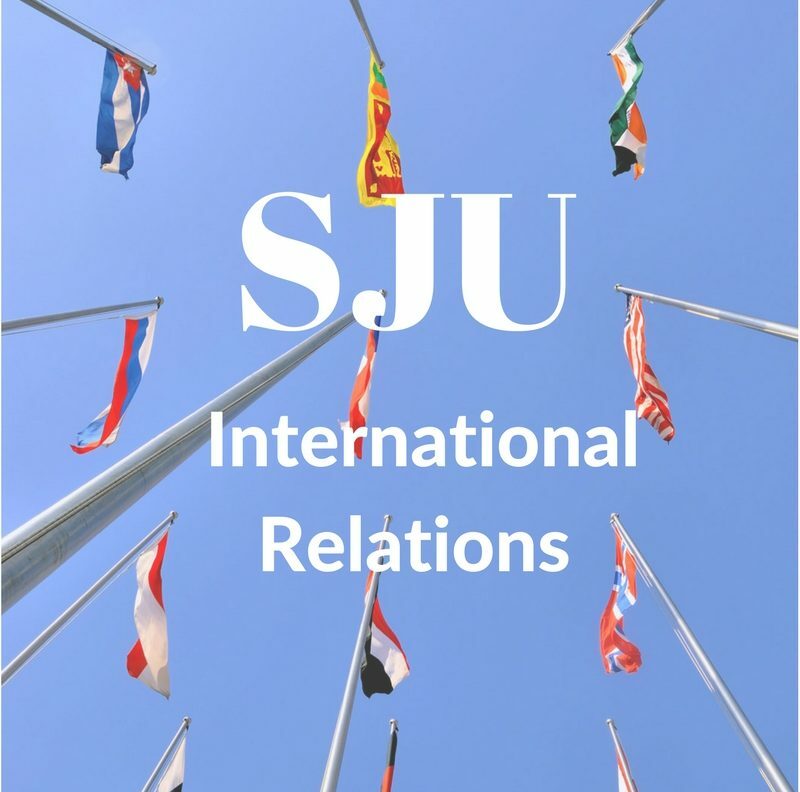 Students from SJU have been placed in offices from a diverse sampling of countries and political parties. The internship experience varies widely based upon the needs of your supervisor, as well as your skills. Some interns research, translate, or write draft speeches. Others attend meetings and write briefings for their MEPs or help organize events/host ambassadorial visits with their supervisors. So far, I have primarily researched, attended meetings, and written briefings on behalf of my supervisor. Dr. Sant is a member of the ECON and US-Delegation committees, so most of the meetings I attend will revolve around those topics. Last week, I attended a meeting with the US Mission to the European Union and the US Mission to NATO which was particularly excit ing. I am most looking forward to traveling to Strasbourg in November for the Plenary session! That’s all for now! Check back next week for updates from myself and other SJU interns. What a wonderful and exciting opportunity. Good luck Erin. Thanks for sharing your experiences so thoroughly and eloquently. My daughter Molly studied at the Leuven Institute through SJU in spring 2016. She had an amazing experience, as I am sure you will, too. Best wishes!